Our PROGRAM SCHEDULE WIKI displays our most current scheduling. Please contact programming to make changes/additions/deletions (your changes will not be saved). We hope to finalise the schedule by Sept 15th and will make every effort to accommodate your requests. Albacon loves costumes. We encourage our members to wear them throughout the con. Unlike costumes created especially to be shown onstage during the masquerade, hall costumes are costumes that are comfortable and sturdy enough for you to wear for hours at con events, parties, and in the halls! You may win a hall costume award ribbon and certificate from one of our roving hall costume judges. A hit from last year, Albacon is repeating the Thursday evening Writers' Workshop Party. Music. Magic. Mayhem. Mystical Mavens. Dress Up. Get your fortune told. Dance the night away. 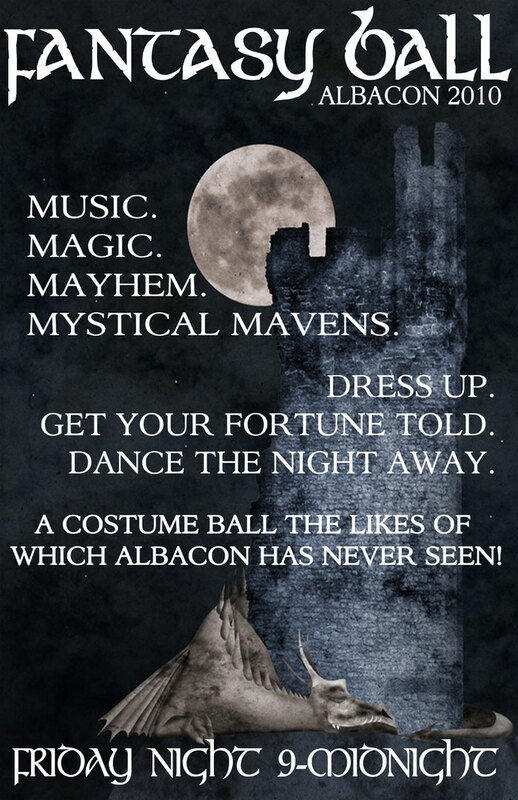 A costume ball the likes of which Albacon has never seen! The Masquerade is Saturday evening�s big show! Costumers from the local area and beyond will present their creative best in a stage show the evening of Saturday, October 9. Expect everything from one-person presentations of marvelous costuming design to elaborate team presentations of costumes that glow and rotate! The show will take place in the Squire Room. You�ll want to get a good seat. For those wishing to participate in the Masquerade, please download the forms below. To help us entertain our fellow fen, come to the masquerade registration desk on Friday. Otherwise, we look forward to entertaining you on Saturday evening!